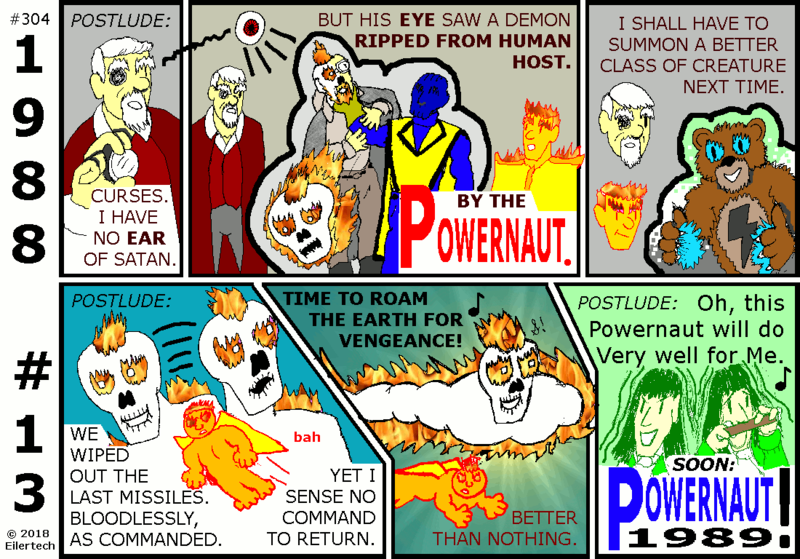 Powernaut 1988: Historic Journals of the Powernaut! Powernaut: Home 1912 1941 1944 1945 (with Stories) 1948 1954 1955 1962 1964 1966 1968 (with Stories) 1969 1976 1979 1984 1985 1987 1988 (with Stories) 2005 (with Stories) 2006 (with Stories) 2008 2009 (with Stories) 2011 (with Stories) 2012 2013 2014 . The Rest of the World: Wiki Home Startup Escalation 1999 2000 2001 2002 2003 2004 2005 2006 2007 2008 2009 2010 2011 2012 2013 2014 2015 The Maker . If It Comes from Hell, It's for HIM! 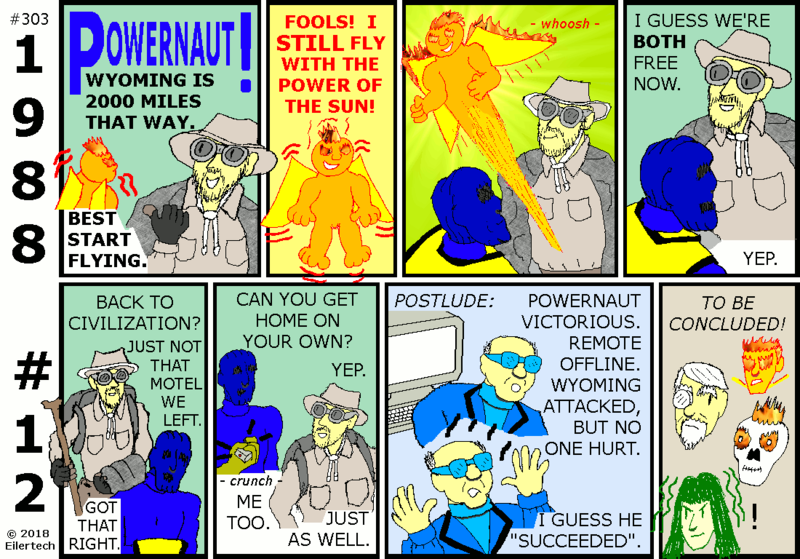 There's a new Powernaut! 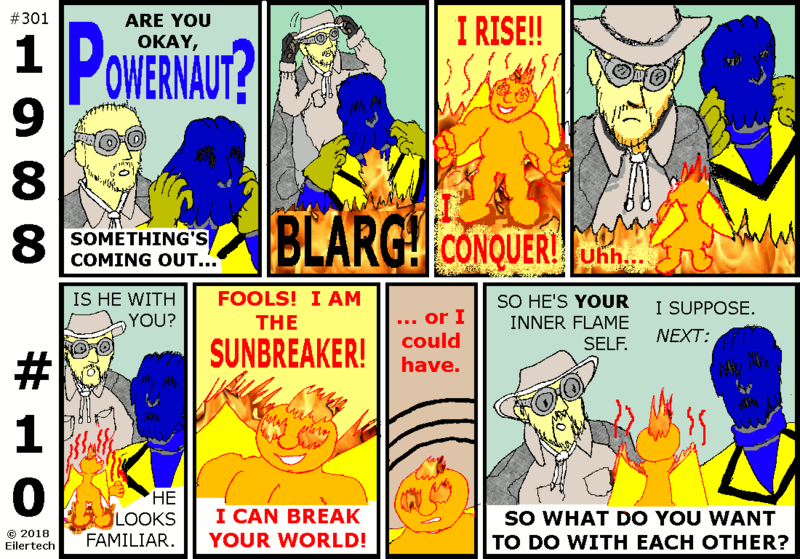 Shining example of whatever, based upon last year's Powernaut comic. 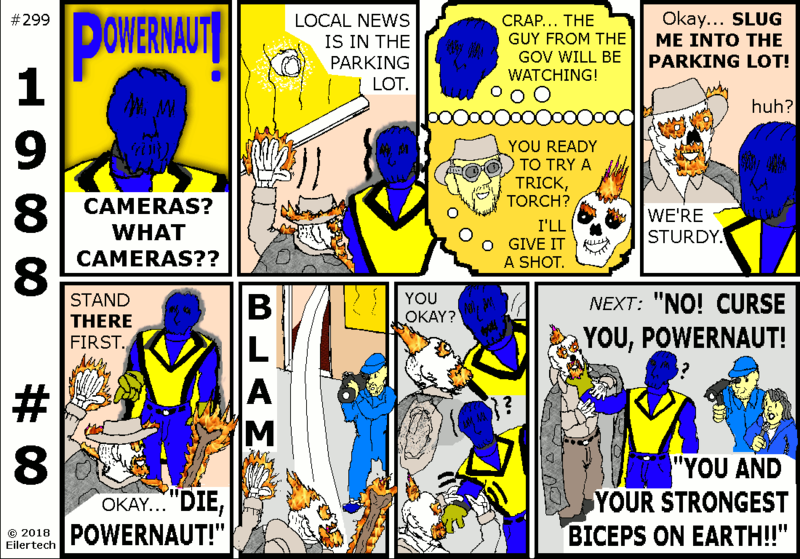 "Whatever" will just have to work that out, because the world needs a new Powernaut! (signed) Scott Eiler, Publisher for Powernaut Comics, 1988. I can finally admit this incident. I kept a diary through the whole thing. But no one would believe how it all ended. So back then, I published it as comic-book fan fiction. In 1988, I was young and idealistic. And I still had facial hair, though it was never impressive. My scalp hair was nice and long, but I shaved it for this occasion. I read Iron Man comics back then. He'd gone on a quest to neutralize some stolen tech of his, even into Russia. And then I found out, the Russians had hacked some secrets of the MX Missile - secrets *I'd* worked on. By the standards of Iron Man comics, my next action was obvious... I *had* to invade Russia myself! I don't go places to kill people, though. I brought tactical goggles, pepper spray, and flashbang and knockout gas grenades. I wore body armor, of course. I carried a bunch of ziptie restraints. And back then, I was pretty good at fighting with a big stick. I'd heard of a credible way to shut down all their new missiles from one missile silo. So I snuck into Russia with an ultralight aircraft. I had an extraction plan. (I figured Greenpeace would pick me up.) But I got stuck. Fortunately, I suppose, my career full of weirdness started then. This was decades ago. I used to remember it differently. For starters, Loki summoned me then... With all the reality shifts I've been through, I'm not surprised some things are different now. But many things are still much the same... for instance, the fact that I *got* extracted from Kamchatka. One might wonder why I seemed to be blackmailing this neophyte Powernaut into working for me and the U.S. Armed Forces. I considered it to be more of an introduction. The United States Government has a legitimate interest in the superhuman powers of its citizens, and it was going to introduce itself to this new Powernaut in any case. I kept this as cordial as possible. One might also wonder why I was so lenient on this Powernaut when the mission didn't go exactly as I intended. 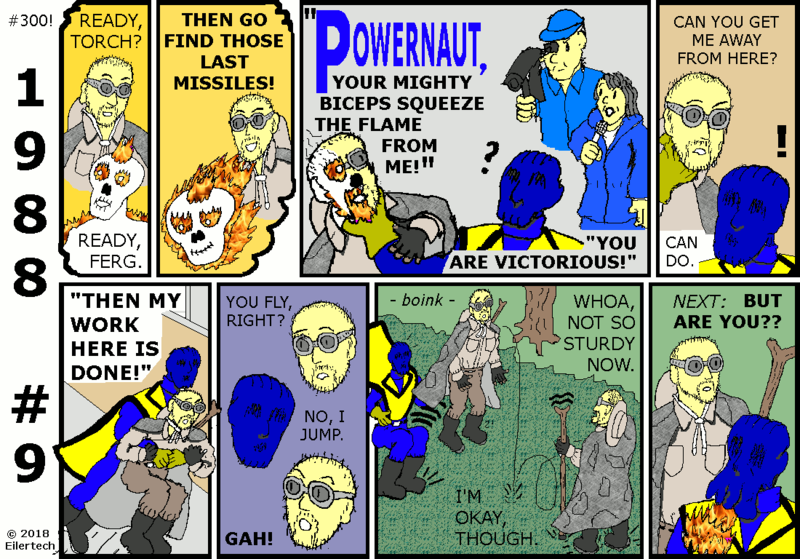 I consider that to not have been the Powernaut's fault. Who could have expected his opponent to send his power elsewhere, while himself under attack? About that opponent... Wyatt Ferguson was himself of interest then. He was just harder to find than the Powernaut was. About the subterfuge... 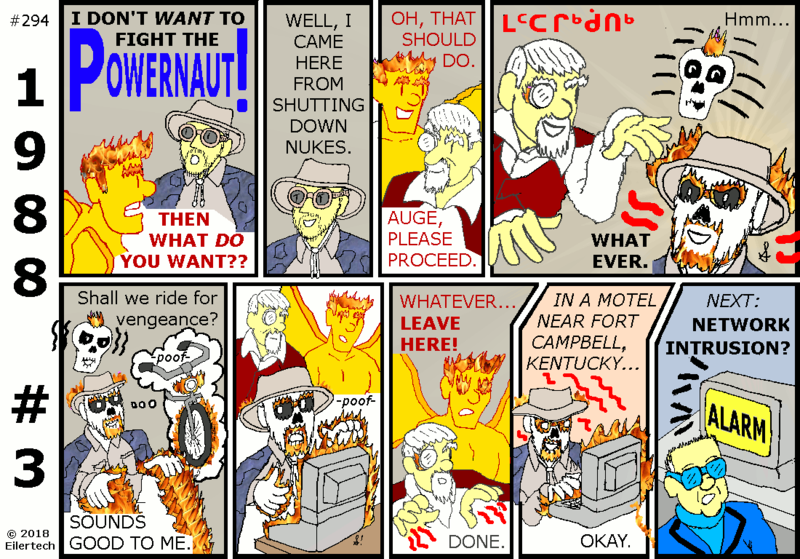 The strip implies some collusion by Wyatt Ferguson and the Powernaut. I had no reason to believe that at the time, however. 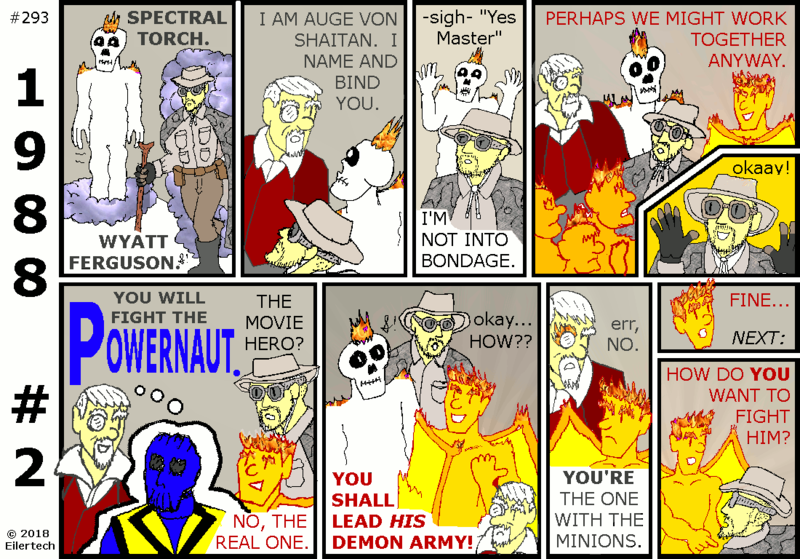 Neither did the many other observers, including Auge von Shaitan who supposedly had mystic vision powers. And Mr. Ferguson has already admitted, his recollection of the events are confused. About the target... Only the U.S. Air Force command and control systems were disrupted. U.S. nuclear submarines were unaffected. A similar disruption happened on the Russian side then. In short, United States security was only minimally affected. 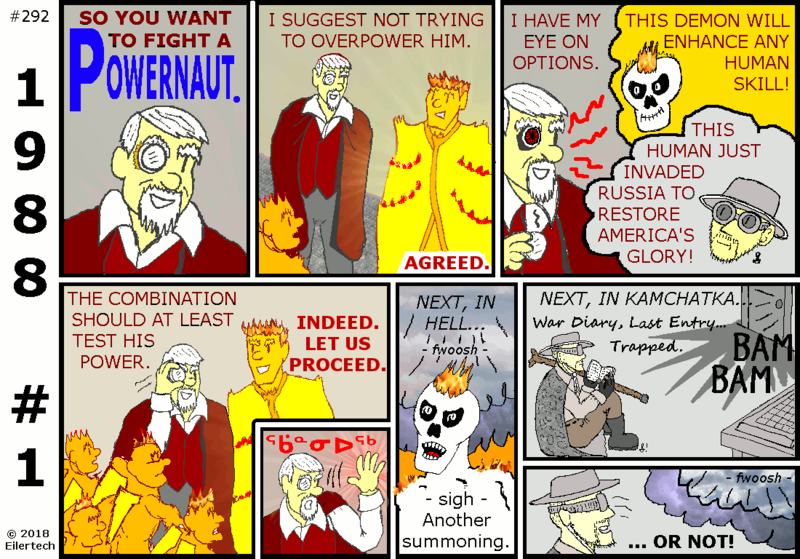 Mr. Samuels correctly notes, my memories of this incident are different than what Powernaut Comics shows. That happens a lot. But that doesn't mean either of us is wrong. In my world, it usually means a reality shift. I was indeed summoned and bound to a demon, to wreak havoc upon the Earth. We did go on a mission of cyber-vengeance. We parted ways after the strongest hero on Earth intervened. 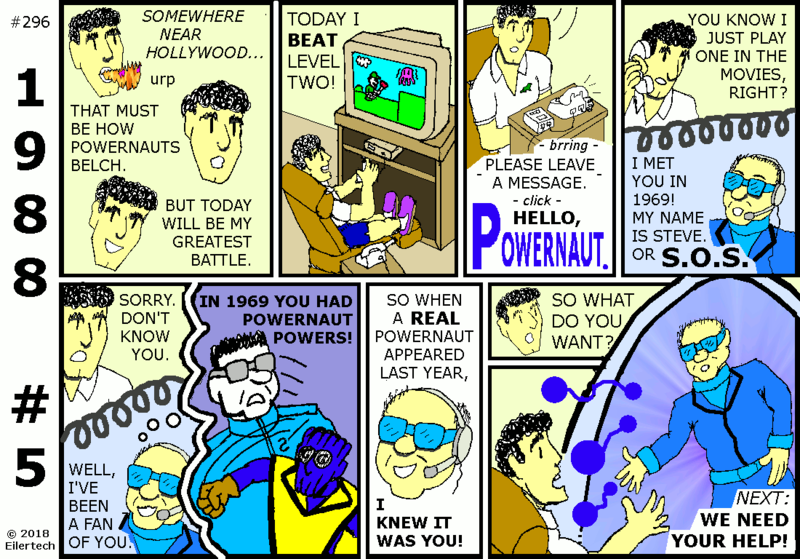 This Powernaut series marks the 30th anniversary of "Me in the Marvel Universe"! That is the origin of Wyatt Ferguson. He has become a pillar of my stories, alongside Ellipsis and eventually the Powernaut. This series can run smoothly as if on rails, if all goes well. I have completed its plotting, drawn the first three issues weeks in advance, and I think I've reconciled it with the old stories. I may have some personal life drama in the meantime, but nothing Our Readers should worry about. 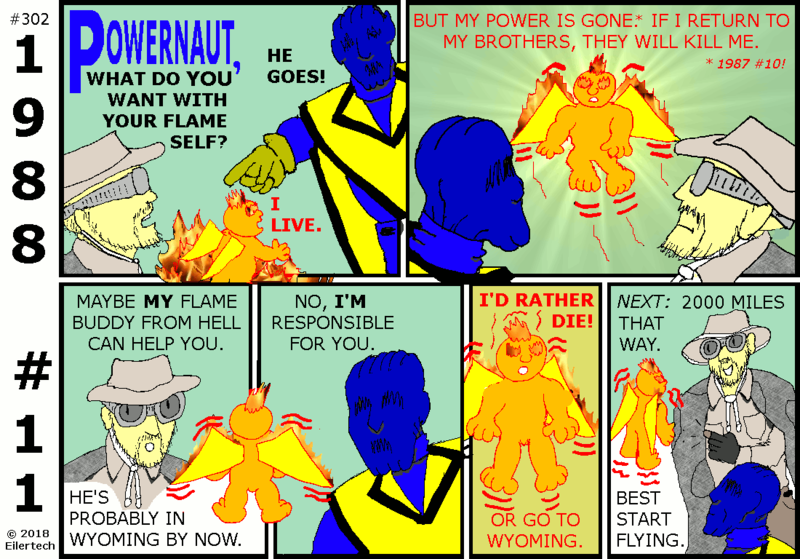 I've published Powernaut Comics from some pretty bizarre places, after all. 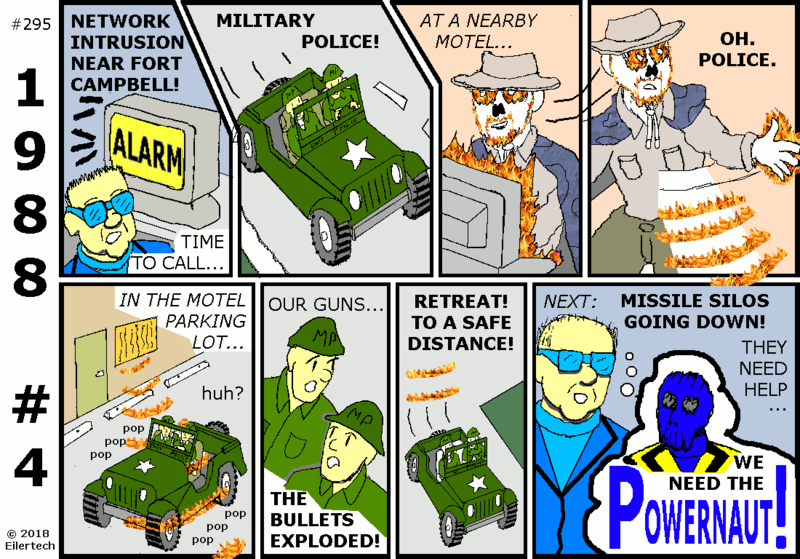 For instance, the most fun I had in Las Vegas was sitting at the hotel bar, publishing Powernaut Comics. I did it for fun, and I don't plan on giving that up. 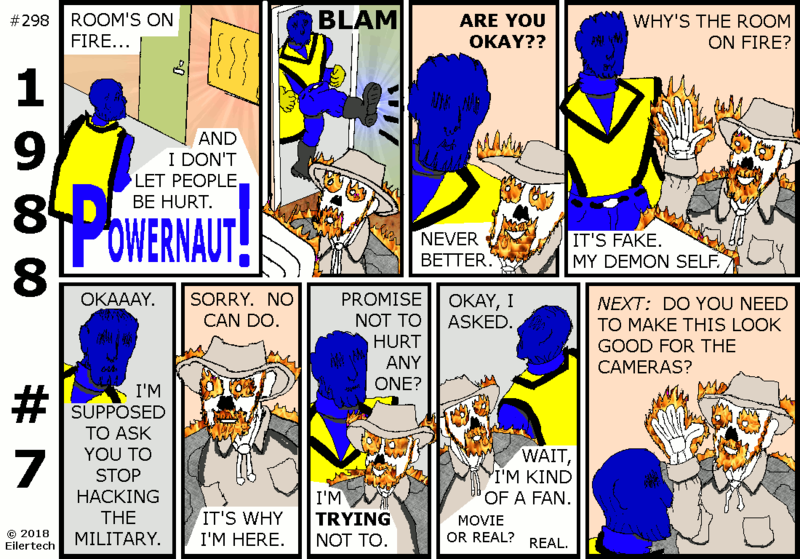 I have tried to increase my artistic standards for this series, and for Powernaut Comics through the 1990s. I need to be ready for really good production values in that decade. I used to say often, when I wrote a good story, "This is such as I have never done before." I think I can say that again now. The resolution is doubled, to match Power School 2013. 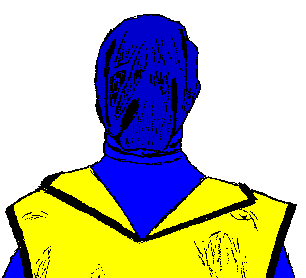 I have put in some shadows, and made character line-drawing colors other than pure black. Whatever failings Powernaut 1987 may have had, its experimental color schemes were well received. 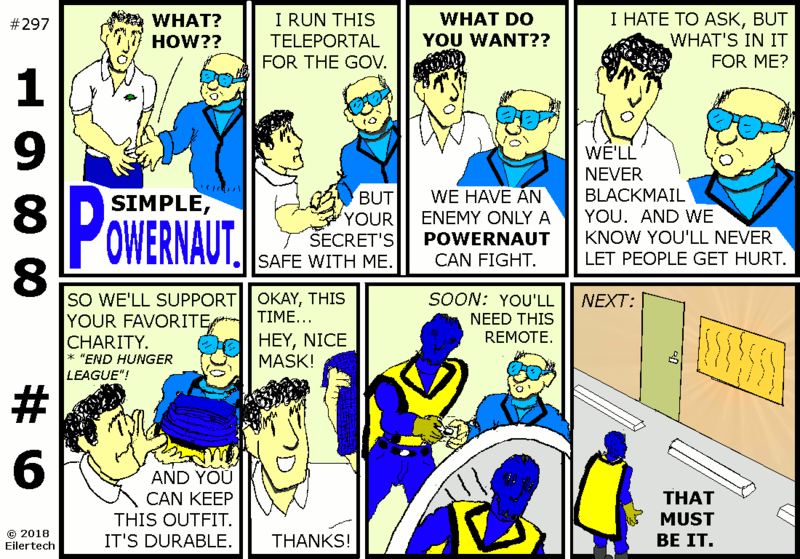 And the 1992 comics will need the shadows; this is on record in Powernaut 2005. It's also time for some *useful* art effects. I've dug up some flame reference (once used for the Demon Missionaries from Planet Hell), to use as a tool for coloring all those beings with flaming heads. I've found many clouds from my personal photos, for filling in teleportals. And I've found some useful fill patterns for stuff like carpet and maybe camouflage. And it is ironic that Wyatt Ferguson finally looks like me in any portrayal. He had a beard back then; he shaved his hair; and he wore tactical goggles. People have finally accused me of drawing myself when I'm not drawing Powernaut 2005! (signed) Scott Eiler, Christmas Eve 2018. The story and all characters and artwork in this fiction are copyright © 2018 by Eiler Technical Enterprises.